Graphic patterns and two-way mirrored glass create optical illusions on these furniture pieces by Royal College of Art graduate Kim Thome. The glass used in all three pieces is reflective but retains some transparency so the brightly coloured patterns on each item are overlayed when viewed at certain angles. 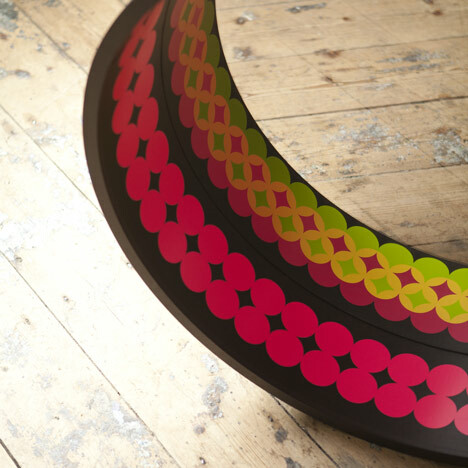 Kim Thome graduated from the college’s Design Products course and the pieces on display at Show RCA 2012, which continues until 1 July. Dezeen filmed an interview with Design Products course leader Tord Boontje who talks about this piece of work whilst giving a tour of the show - watch it here. Kim Thome: The Reflection Range. Developed further from work presented in the ‘Works on Reflection’ installation, these object build on the relations of objects and people that surround them. Materials such as glass and two-way mirror offer visual scenarios that can be explored and choreographed by the viewer, an optical relationship forged between the viewer’s visual perceptions through their movement. These undefined objects explore a new potential for glass and mirror and reconsidering their use within a functional context. Such a semi-transparent and reflective material is manipulated by naturally illuminated shapes in the fore and background of the piece in such a way that the graphic aesthetic becomes something of a relational experience with the viewer. The objects change at the viewer’s discretion, as perspective, movement and light affect the experience every element.